Leibniz is shown at half-length in a painted oval. He wears a dark shoulder-length wig and is dressed in a white shirt, with gold and jewelled clasps at the throat and cuffs with a gold waistcoat. Over this, a red loose robe trimmed with blue collar and cuffs. In his left hand he holds a paper listing his achievements, commencing: “Opus philosophicum. De Arte Combinatoria. Nova calculi differentialis…”. 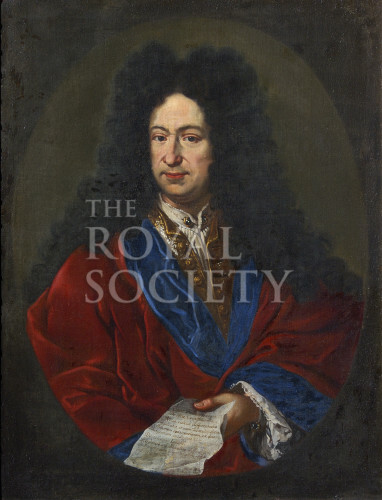 Gottfried Wilhelm Leibniz was elected a Fellow of the Royal Society in 1673. Presented by Dr Wilson of Florence, 1883 (donated with the Society’s portrait of Vincenzo Viviani). The presentation is noted in Council Minutes: “ Dr Wilson, of the Palazzo Piccolini, Florence, having offered, in an interview with the Assistant Secretary, to present to the Society a portrait of Leibnitz and of Viviani, it was – Resolved, – That Dr. Wilson’s valuable offer of the two portraits be cordially accepted...“ [Royal Society Council Minutes, Printed, vol.5 1878-1884, p.400, meeting of 25 October 1883].